US-based Handshake is an innovative network that links universities, students, and potential employers. 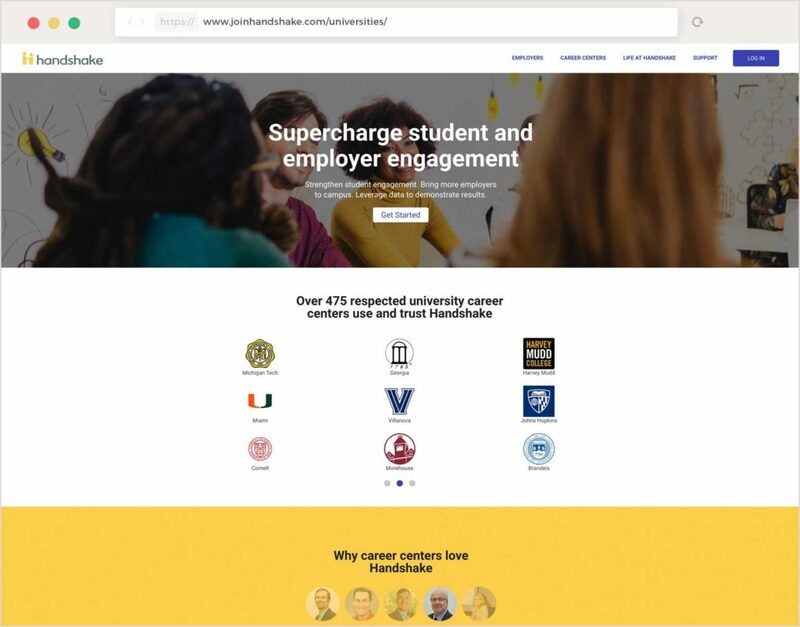 Handshake works with the career centers of 475+ colleges of all types, including Stanford, UC-Berkeley, Princeton, Wellesley, Howard, Illinois, UT-Austin, Michigan, Georgia and hundreds more. By bringing all of these schools together in one network, Handshake makes it easier for employers to recruit at more schools, which increases the opportunities for students from every school and background. The transition between student life and professional environment can be hard and confusing, especially when students look for internships. This is why universities have career centers that help students decide which career path they want to follow. Counselors are there to help students, but meeting with hundreds of students means keeping a challenging schedule. Support from the Cronofy team has been exceptional. We were able to implement a two-way calendar sync feature that was a top request from our career services users in less than one month. This feature has reduced the administrative burden of scheduling appointments for our career services partners, allowing them to spend more valuable time with students. With Handshake, this process is entirely streamlined. Counselors can use the calendar interface to block out time and indicate when they are available to meet with students. Students simply have to log on to the Handshake platform and book the timeslot that works for them to confirm the appointment. Before Cronofy, that meant counselors had to log on to Handshake to check their schedules and see when they had appointments, separate to their own personal calendar on Google, Outlook or other systems. It could also lead to double-bookings if they had committed to something before checking their Handshake calendars. This is what happens when tools and applications aren’t synced with our main calendars. Missed appointments and having to reschedule costs time and money, and adds to everyone’s workloads. The Handshake team was looking for a solution to improve the appointment booking process. They identified calendar sync and Cronofy’s Calendar API as the technology that would help them provide booking based on counselors’ real-time availability and push appointments directly to their calendars. Implementing Cronofy was painless – they provide a simple and clear API that allowed me to have the integration live to customers in less than one month. Two-way calendar sync is now implemented in the Handshake application for career center users. It leverages Cronofy’s technology and works with all major calendar services, which was an important requirement from the start. Many universities use calendar services like on-premise Exchange and Office365 for their calendar tools. These services are known for being hard to integrate with. Cronofy removes this hurdle. Handshake developers were able to focus on creating a great appointment scheduling feature for their users. The two-way calendar sync helps counselors keep both their Handshake and university calendars up-to-date. When a student books an appointment in Handshake, the timeslot will appear as busy in the counselor’s calendar. There’s no risk of double-bookings as everything updates in real-time. When a timeslot is booked in the counselor’s university calendar, a one-time event will also be created in Handshake, ensuring that students see that time marked as busy. University staff and students are already reaping the benefits of two-way, real-time calendar sync. Career centers have quickly adopted this new feature with over 1720 connected calendars. That’s 19% of Handshake users leveraging Handshake’s new appointment scheduling feature. This has helped get the appointments tool live at 83% of Handshake schools. Having worked with countless CMS providers, we’ve never had a true two-way sync with our Mac versions of Outlook. Handshake’s integration is almost instant, setup for our staff was a breeze, and it has resolved a major inefficiency in our scheduling and planning. I really didn’t believe it could be done, and we couldn’t be happier with the results. It only takes the counselors a few minutes to activate two-way calendar sync. They authorize calendar sync through Cronofy and can revoke that access at any time. If you want to build seamless real-time scheduling into your software and applications – no matter the calendar service – then check out our Calendar API. We provide you with guides, tutorials, and live support to help you build and create to your heart’s content. Book your demo today to find out more about how two-way calendar sync can take your software to the next level.